He said the International Criminal Court has “grabbed Charles Taylor…(former President of Liberia)”; and “Gbagbo is also facing the ICC”… (former President of Ivory Coast); “Some of them here will have to face the ICC too….”, for he has invited the ICC into Sierra Leone, the President of Sierra Leone said. He said that some of those who think they can stimulate violence with impunity may not be around to take part in the November, 2012 General Elections in Sierra Leone.The crowd shouted their approval. 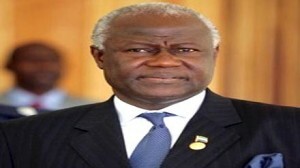 While insisting that the ceremony was not one for political campaigning, President Koroma apparently lashed out at his political opponents who he obliquely accused of being behind the spate of political violence in the country: “Don’t take us back into the Darkness from which we have come from”.And, using the apt imagery of the APC party symbol, the sun, President Koroma said, “You can’t cover the sunlight.The sun’s light can’t be blocked.Even if you are in a hole, the sun’s light would manage to penetrate there…We are not turning back with the development we engaged in now…”. The crowd chanted praises to him enthusiastically; and the women broke into a Temne song that said, ‘It is not just bluffing that you will do this or that…You must show us what you can do, like our Ernest has done for us…’.